Pope John XXIII is his first ecumenical council did many exciting things. 3) Eating fish on Friday no longer required etc. There was one important way that prayer was changed. We no longer had to restrict ourselves to the given prayers of the church and we were encouraged to make up our own rosaries, mysteries and chaplets. As God's message was love, I wrote the Love Mysteries many years ago. As I teach Sunday School, lead a prayer group, K of C etc.. I teach them to anyone who wishes to use then in addition to the Joyful, Sorrowful, and Glorious Mysteries of the Rosary. The Love Mystery Rosary is prayed on a standard 5 decade rosary. 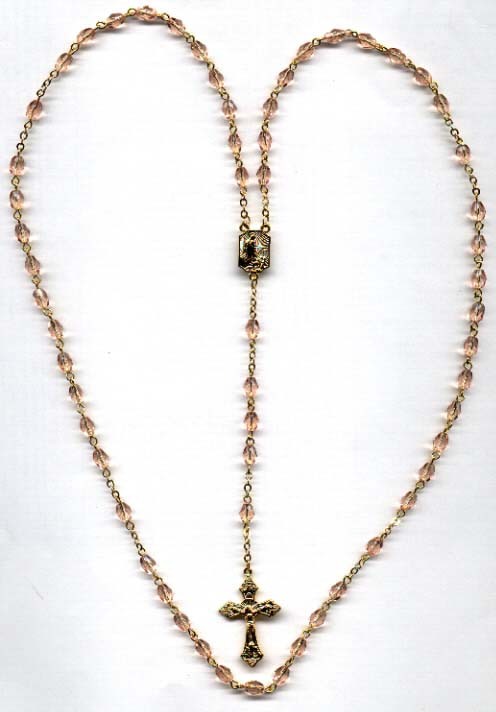 The color for this Rosary is a light pink or coral beads. The meditations are the individuals choice. 1. The Love of God the Father, Creator of Heaven and Earth. 2. The Love of Jesus Christ, Son of the Father, our Redeemer. 3. The Love of the Holy Spirit who teaches us to forgive and forget. 4. The Love of the Blessed Virgin Mary who intercedes to Jesus for us. 5. The love of St. Joseph. The order in which the prayers are said are the same as the 5 decade Dominican Rosary. On each decade Announce the Love Mystery for that decade and say 1 Our Father, Announce meditate and pray on each of the 10 Hail Mary beads; Pray I Glory be; and Pray 1 Fatima prayer. Love of God The Father Almighty, Creator of Heaven and Earth. 10th Bead for earth's harmony and the mysteries of the cycles of life. Love of Jesus Christ our Redeemer. 10th Bead on the decent of the Holy Spirit. I concentrate of the gifts that come of The Holy Spirit. 10. The gift to forget ills done to us by our trespassers. Love of the Blessed Virgin Mary who intercedes to her Son Jesus and love of her anguishes she suffered for us. 1. The anguish of the annunciation and telling to Joseph that she was with child. 2. The hardship of the trip to Bethlehem being 9 months pregnant. 3. Delivering a child alone in a stable as no one offered them help or a place. 4. The prophecy of Simeon in the temple. 5. The Fleeing to Egypt to save the Child's life who was only several days old. 6. Losing Jesus in Jerusalem at age 12. 7. The foretelling of his passion by Jesus to Mary. 8. Watching Jesus being arrested and dragged to judgement. 9. Watching Jesus' embarrassment of being stripped naked in front of his mother and then scourged. 10. Watching her son's life slip away on the cross unable to console him. 1. Acceptance of the unborn child. 3. Teaching the child to read and write.3-teaching the adolescent Jesus to become a carpenter. 5. Understanding Mary's needs to follow her son. 6. Raising /guiding their other children in the absence of Mary. 7. Joseph always a faithful provider. 8. Joseph's powerful intercession to Jesus.